About 9 months ago I had to euthanize my last cat. It was very difficult and I needed to take some time before I brought another kitty into my house. Once I decided it was time I had to get ready for our new roommate. Here are some basic instructions for the cat tower I decided to make so my cat would have a place to retreat to when the world got a little crazy or the grandkids came over. I had never done anything like this before, I got some ideas from the internet and then decided to just wing it from there. It definitely isn’t fine woodworking but my new cat is just fine with it. 3/4″ OSB, 2″ PVC piping, 2″ wood dowel, sisal rope and 2 part epoxy. The bottom and middle are 24″ x 24″ and the top is 24″ x 18″. I then created the box that has 2 sections with 3 entry points. My intention is to get a 2nd cat eventually. The box is 24″ high and 18″ x 18″ square. I first cut the 4 sides, then marked the placement of the 2 holes in 3 of the 4 sides. I then assembled the box using triangle pieces cut from scrap 1 x 4 placed in the middle of the sides to provide the base of the upper box. Placing corner braces to support upper box base. I cut the shelves to size and cut off the corners. Box with top and bottom and 2 supports. I used 24″ long 2″ diameter PVC pipes for the support posts. I glued 6″ lengths of wood dowels into the ends to have something to screw into when attaching to the shelves. I then wound sisal rope around the PVC for the cats to use as scratching posts. I then covered everything with carpet that I found at the Habitat for Humanity Restore for under $15. The Division of Real Estate has been made aware of criminal activities taking place at open houses listed for sale. The Denver Police Department has received reports of homes listed for sale being burglarized over the last couple of weeks. All the homes involved had held an open house and were later burglarized. Thieves are attending the open house during the day and scouting out ways to gain access; later returning and burglarizing the home. This is an important reminder to take extra precautions with homes you are listing and opening up to the public. Law enforcement recommends developing a good process for checking and ensuring all access points to the home are secured. Denver Police are urging everyone to be on the lookout for anything that seems suspicious at homes listed for sale. If you see suspicious activity or a home that looks like it may have been burglarized, please contact the Denver Police Department through its non-emergency number at (720) 913-2000. Be sure you have a dimmer switch that works with the type of light bulb you are using. CFL and LED light bulbs require special dimmer switches. The light fixture wattage must not exceed the dimmer capacity. Replace single pole switch with single pole dimmer and 3-way switch with 3-way dimmer. Install only one dimmer in a 3-way circuit. Wiring for your dimmer may not match the drawings below always verify with the manufacturer’s instructions. NOTE: You will need to attach the dimmer leads using wire “nuts” or connectors. The wires from a dimmer switch will appear different than the wires attached to your existing switch. They are what are known as “stranded” wire. Stranded wire is composed of a bundle of small – gauge wires wrapped in a single piece of insulation to make a larger conductor. Stranded wire is more flexible than standard wire. Identify the type of switch you are replacing and purchase the correct dimmer switch. a) Single Pole or 3-Way? b) incandescent, halogen or CFL, LED? Attach your wires, using wire nuts, according to the drawings above and/or the instructions supplied with your dimmer switch. Be sure all connections are correct and secure. Tuck wires back into box and mount switch to box – don’t replace the cover plate yet! Return to Service panel and restore power by switching the breaker to the “on” position. Actuate switch to verify lighting works properly. Colorado often has weather conditions causing a freeze/thaw cycle which can cause damage to our homes and it’s components. The freeze/thaw cycle occurs when the temperature falls below freezing and returns to above freezing at frequent intervals over a period of time. One of the most damaging effects on our homes caused by the freeze/thaw cycle is called “ice damming”. Ice damming is caused when the heat from a house begins to melt the snow on our roof from underneath. This melted snow or water runs towards the edge of the roof. When the roof has an overhang where the heat does not melt the snow it creates a snow or ice dam at the edge of the roof. This dam traps the water and prevents it from flowing freely into the gutters and forces it to back up under the shingles or other roof layers. The freeze/thaw cycle will cause this to continue until a leak or damage to underlying roofing materials occurs. What can cause the conditions that result in ice damming? How can I tell if I have an ice dam? One of the main indicators that an ice dam may be forming is the presence of icicles. Although you might find icicles hanging from a roof to be pretty they are most often an indication of a problem. How do I prevent ice damming? Install heating cable along the edges of the roof where ice damming is occurring. Installing heat cable is something you can do yourself but you will need 2 very important things. A reliable, GFCI protected power source and the ability to work on your roof safely. Improve attic ventilation and insulation to reduce differences in temperature. Attic ventilation modification should only be done by a qualified contractor and roofer. We purchased a waterfall and pond in a box from Costco of all places. It showed up in a 1800 lb box delivered to our doorstep or rather our sidewalk, about 10 days after we placed the order. The instructions say that you should be able to complete the project in a day. Of course I’m experienced enough with these types of projects to know that is overly optimistic, however I certainly didn’t expect it to take 5 days!! I’ll go through the steps in the project and highlight the mistakes we made along the way that contributed to the project taking so long but I do blame a lot of the problems on the poor instructions that were provided with the kit. The first step of course was to clear out a spot. We rented a sod cutter for this project even though the area was pretty small. For about $25 as a rental from Home Depot it makes the job so much simpler. The edges are curved to make mowing easier. Next you need to determine where you will put the pond and waterfall and create an outline with the cord they provide and then paint it. Then it’s time to dig the hole for the pond. I recommend deep but not too big around. The deeper you make it the easier it will be to hide the pump. The instructions say to use the dirt from the hole to compact and sculpt the waterfall. You will need to either buy more dirt or find it from another source because you won’t have enough otherwise. We just dug dirt from the surrounding area and back filled it with the sod and dirt we had just removed. 1. They assume you are putting this in a corner of your yard where you are not concerned about what the ‘back’ of the waterfall looks like AND that when you compact the soil you will have support to hold in the dirt. We ended up having to build a stone wall for the back support. 2. They don’t tell you that the outside diameter of the pond should not be larger than the width of your waterfall spillway. It will prevent leaks later on and you will be very grateful you followed my suggestion. 3. Make sure your dirt mound, which you will use to create your waterfall and spillway, are much wider than you will ultimately want so you can create a spillway that will not ‘leak’ out of the sides. Next build your waterfall and sculpt your waterway. I’m sorry I don’t have a picture of our dirt mound and sculpted spillway but it wouldn’t have help anyway because it turns out I did it wrong and we spent HOURS fixing leaks from the waterfall spillway. After your spillway is sculpted you will cover the entire thing with the liner provide and dry fit your spillway stones. 1. When you sculpt the spillway out of the dirt mound be sure that that your spillaway looks like steps with shoulders all the way down, including the vertical sections. The shoulders on the horizontal sections should be at least 2 inches higher than your spillway stones and do not let your spillway stone extend out beyond your shoulders on the step below. 2. Dry fit all of your spillway stones and pay attention to be sure your liner and spillway will stop any water from ‘leaking’ out of the spillway area. If you look closely at the picture here you will see the big stone on the 2nd step from the top and the one just below it. Both of those extend beyond the side edges of the ‘sculpted spillway and direct water outside of the spillway area. Next mortar your spillway stones in place and set your pump, tube and exit points. You’ll need to wait at least 1/2 day to let your mortar set before you lay the rest of the stones in place. We ended up having to buy another bag of mortar since one wasn’t enough. Once your mortar is set you can set in place the other stones in place. I recommend you set your pump in the pond, run the tub up to the top and figure out how to best conceal it before going too far. This is just before we filled with water for the first time. What we discovered was all of the mistakes we made during the sculpting of the spillway resulted in a lot of leaks that had to be stopped. The water would run out of the waterfall an into the surrounding yard. It was incredibly frustrating to try to solve. I can’t tell you how many times we moved all that flagstone around trying to find leaks and repair them. Here is the final product. We ended up building another smaller wall behind the one supporting the dirt mound to give it a more finished look. We planted a couple flowering bushes and use the left over stones to make a dry stream bed leading up to the waterfall. I am ultimately very happy with the results but very disappointed in the poor instructions that came with the kit. If you decide to do one of these yourself. Please contact me for tips and tricks! As you are probably aware, your ornamental fruit tree is susceptible to disease and bugs. Whether you desire an ornamental fruit tree for its aesthetics or you wish to pick fruit off your tree, you should develop a plan to help the tree fight off these pesky predators. And what better way to help put a smile on your fruit tree’s face than by utilizing the organic way! Preventative medicine is best applied by a reputable and honest tree care company. A certified arborist can work with you to develop an organic tree care program that works best with your beloved fruit tree. A fruit tree is a living being and needs sustenance and nurturing to thrive and grow. Five things are crucial to a healthy fruit tree. If you’re like me you are probably sick and tired of the chill you feel on the back of your neck when sitting in front of your window or feeling the chill in your bedroom when you’re getting ready for bed. If so, I have found a solution that is much less expensive and more effective than spending $1000’s on replacement windows, Warm Window Shades. This is the first in a series of short articles about Warm Window Shades and my adventure in making them for my home. I first heard about warm window fabric from a student who took my home maintenance class, “The Morning After Closing”. I decided to do some research for myself and this is what I found. What is Warm Window Fabric? Warm Window fabric is a four layered insulated fabric consisting of (1) a moisture resistance lining, (2) high density needled hollow fibers, (3) reflective polyethylene vapor barrier, (4) metalized Poly with needled air-trapping polyester fibers. This fabric is the basis of the Warm Window Shade. How does it compare to standard windows for insulating ability? Let’s compare R-Values. As a reminder R-Value is the measurement of a material’s resistance to the flow of heat. The higher the R-Value the greater the capacity of the material for insulating. For comparison: An old style single pane window has and R-Value of about R-1 and typical double pane window range from R-2 to R-3 depending on the quality. Adding a Warm Window Shade can increase the R-Value to R-7.5 something no window currently on the market can achieve on its own. How much will it cost to make and install a Warm Window Shade? I have made 4 roman style shades of varying sizes. The average cost of materials was $80/shade. It took me an average of 3 hours to make each shade and about 1 hour to install. Where can I get the materials? I found my materials and accessories at Denver Fabrics www.denverfabrics.com. (2777 W Belleview Ave, Littleton, Colorado 80123 (303) 730-2777) You can also buy material online at www.warmcompany.com . Because some idiot sued them when a child got hurt in a shade drawstring they no longer sell the components for the roman shade but the fabric store had everything I needed. They do have materials for other shade styles. Are there instructions for making my own shades? I purchased a booklet on how to make a variety of different shade types at the fabric store. I also found that some instructions could be downloaded from the Warm Window website. http://www.warmcompany.com/wwpage.html. You cannot find the instructions for the roman shade at their site because of the law suit. If you’d like a copy please let me know or call Denver Fabrics to see if they have any more instruction booklets. My next few posts will be about what I went through and discovered while making my shades. My next project will be to make side draw shades for the large exterior door in our family room. PRLog (Press Release) – Dec 23, 2010 – Tis the season for celebrations and festivities as we close down 2010 and look forward to 2011. In addition to all the joy and happiness you’re spreading this holiday season, we’d like to toss you a friendly reminder to bring joy and happiness to our local environment by Recycling Your Christmas Tree this year. Christmas Tree Recycling has many advantages for the community as well as the landscape. If you use your local waste disposal company for tree removal, you may only be adding your Christmas tree to the already overcrowded landfills in our state since many of these companies do not recycle trees or wreaths. If you choose to recycle your Christmas tree this year, your recycled tree will end up as mulch or other useful gardening supplies that help reinvest in our beautiful community next year and beyond. or give us a call at 303-795-2381 and we’ll get you on the calendar for a date of pickup. On that specified morning, simply leave your tree at the curb by 8am and we’ll pick up your tree and take it to the recycling center. It’s that easy! And the cost this year is only $15! So this season, help Arborscape help Colorado sustain its beautiful landscape and Recycle Your Christmas Tree! ArborScape is a family business owned by David Merriman. David started learning the arborist trade at the age of 10, working alongside his father in and around Greeley, Colo. He has studied horticulture at the University of Wyoming, Tarrant County Junior College, and Front Range Community College. Based in Denver, CO, ArborScape was founded in 1996 and has grown from a one truck operation. In 2009, we completed over 2000 tree care and landscape projects. It happens to be raining today in Denver, Colorado and it reminds me that this is the perfect time to do some quick visual checks of the outside of your home and make a list of some items you might need to take care of once the rain stops. For several of these items you’ll need to get out the umbrella or put on a raincoat but it’s well worth it. So let’s start by taking a walk around the outside of the house to see where all that water is going. 1. Check your gutters. Is water flowing over the side? Do you have leaks behind the gutter? Do you have leaks at seams along the gutters? 2. Check your downspouts. Is water flowing out? Are the extensions in good shape? Where is the water flowing to? 3. Check the area around the house and foundation. Is it damp? Is water pooling next to the foundation? Now it’s time to go inside, don’t forget to bring the ladder. 4. Set up the ladder and take a look inside your attic. Does it smell damp? Can you see water dripping down any of the pipes or vents that go through the roof? Do you see stains on the roofing materials? Is there any evidence of rust on metal pieces? 5. Check all of your windows? Is there water leaking past any of them? Can you feel cold air? 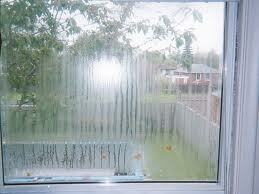 Is there condensation between the panes of glass? My next post will tell what these problems mean and some tips on how to fix them.